The Sturmabteilung (SA; German pronunciation: [ˈʃtʊɐ̯mʔapˌtaɪlʊŋ] ( listen )), literally Storm Detachment, was the Nazi Party's original paramilitary. It played a significant role in Adolf Hitler's rise to power in the 1920s and 1930s. Its primary purposes were providing protection for Nazi rallies and assemblies, disrupting the meetings of opposing parties, fighting against the paramilitary units of the opposing parties, especially the Red Front Fighters League (Rotfrontkämpferbund) of the Communist Party of Germany (KPD), and intimidating Romanis, trade unionists, and, especially, Jews – for instance, during the Nazi boycott of Jewish businesses. 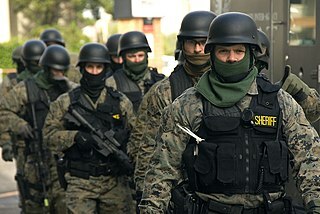 A detachment is a military unit. It can either be detached from a larger unit for a specific function or be a permanent unit smaller than a battalion. The term is often used to refer to a unit that is assigned to a different base from the parent unit. The Milizia Volontaria per la Sicurezza Nazionale, commonly called the Blackshirts or squadristi, was originally the paramilitary wing of the National Fascist Party and, after 1923, an all-volunteer militia of the Kingdom of Italy. Its members were distinguished by their black uniforms and their loyalty to Benito Mussolini, the Duce (leader) of Fascism, to whom they swore an oath. The founders of the paramilitary groups were nationalist intellectuals, former army officers and young landowners opposing peasants' and country labourers' unions. 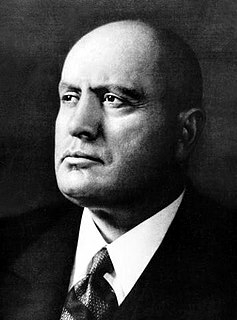 Their methods became harsher as Mussolini's power grew, and they used violence and intimidation against Mussolini's opponents. In 1943, following the fall of the Fascist regime, the MVSN was integrated into the Royal Italian Army and disbanded. The Night of the Long Knives, or the Röhm Purge, also called Operation Hummingbird, was a purge that took place in Nazi Germany from June 30 to July 2, 1934, when Adolf Hitler, urged on by Hermann Göring and Heinrich Himmler, carried out a series of political extrajudicial executions intended to consolidate his hold on power in Germany, as well as to alleviate the concerns of the German military about the role of Ernst Röhm and the Sturmabteilung (SA), the Nazis' own mass paramilitary organization. Nazi propaganda presented the murders as a preventive measure against an alleged imminent coup by the SA under Röhm – the so-called Röhm putsch. The term Sturmabteilung predates the founding of the Nazi Party in 1919. Originally it was applied to the specialized assault troops of Imperial Germany in World War I who used Hutier infiltration tactics. 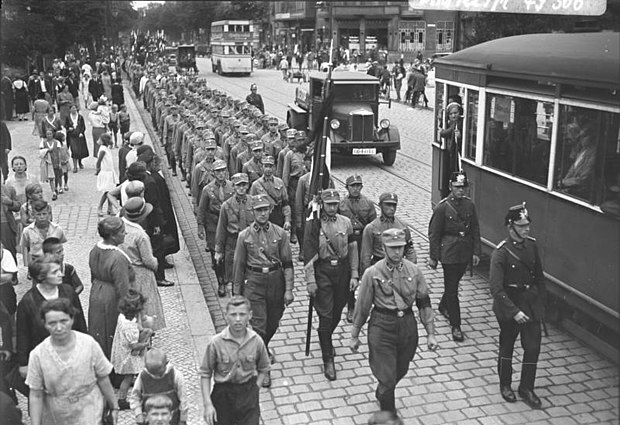 Instead of large mass assaults, the Sturmabteilung were organised into small squads of a few soldiers each. The first official German Stormtrooper unit was authorized on 2 March 1915. The German high command ordered the VIII Corps to form a detachment to test experimental weapons and develop tactics that could break the deadlock on the Western Front. On 2 October 1916, Generalquartiermeister Erich Ludendorff ordered all German armies in the west to form a battalion of stormtroops. They were first used during the 8th Army's siege of Riga, and again at the Battle of Caporetto. 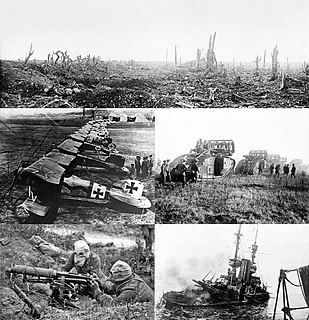 Wider use followed on the Western Front in the Spring Offensive in March 1918, where Allied lines were successfully pushed back tens of kilometers. Oskar Emil von Hutier was a German general during the First World War. He served in the German Army from 1875 to 1919, including war service. During the war, he commanded the army that took Riga in 1917 and was transferred to the Western Front in 1918 to participate in the Michael offensive that year. He is frequently but mistakenly credited with inventing the stormtroop tactics his forces employed to great effect during the Michael offensive. After retiring from the Army in 1919, he presided over the German Officers' League until his death on 5 December 1934. The Völkischer Beobachter was the newspaper of the National Socialist German Workers' Party from 25 December 1920. It first appeared weekly, then daily from 8 February 1923. For twenty-four years it formed part of the official public face of the Nazi Party until its last edition at the end of April 1945. The paper was banned and ceased publication between November 1923, after Adolf Hitler's arrest for leading the unsuccessful Beer Hall Putsch in Munich, and February 1925, the approximate time of the rally which relaunched the NSDAP. The Hofbräuhaus am Platzl is a beer hall in Munich, Germany, originally built in 1589 by Bavarian Duke Maximilian I as an extension of the Staatliches Hofbräuhaus in München brewery. The general public was admitted in 1828 by Ludwig I. The building was completely remodeled in 1897 by Max Littmann when the brewery moved to the suburbs. All of the rooms except the historic beer hall ("Schwemme") were destroyed in the World War II bombings. The reopening of the Festival Hall in 1958 marked the end of the post-war restoration work. The National Socialist Program, also known as the 25-point Program or the 25-point Plan, was the party program of the National Socialist German Workers' Party (NSDAP). Originally the name of the party was the German Workers' Party (DAP), but on the same day as the announced party program it was renamed the NSDAP, Nationalsozialistische Deutsche Arbeiterpartei. Adolf Hitler announced the party's program on 24 February 1920 before approximately 2,000 people in the Munich Festival of the Hofbräuhaus. 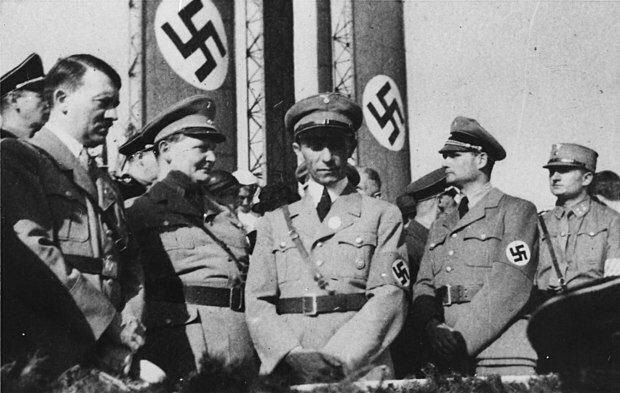 The National Socialist Program originated at a DAP congress in Vienna, then was taken to Munich, by the civil engineer and theoretician Rudolf Jung, who having explicitly supported Hitler had been expelled from Czechoslovakia because of his political agitation. In 1922, the Nazi Party created a youth section, the Jugendbund , for young men between the ages of 14 and 18 years. Its successor, the Hitler Youth (Hitlerjugend or HJ), remained under SA command until May 1932. Hermann Göring joined the Nazi Party in 1922 after hearing a speech by Hitler. He was given command of the SA as the Oberster SA-Führer in 1923. He was later appointed an SA-Gruppenführer (lieutenant general) and held this rank on the SA rolls until 1945. Blomberg and von Reichenau began to conspire with Göring and Himmler against Röhm and the SA. Himmler asked Reinhard Heydrich to assemble a dossier on Röhm. Heydrich recognized that for the SS to gain full national power the SA had to be broken. He manufactured evidence that suggested that Röhm had been paid 12 million marks by French agents to overthrow Hitler. Hitler liked Röhm and initially refused to believe the dossier provided by Heydrich. Röhm had been one of his first supporters and, without his ability to obtain army funds in the early days of the movement, it is unlikely that the Nazis would have ever become established. The SA under Röhm's leadership had also played a vital role in destroying the opposition during the elections of 1932 and 1933. Hitler was also concerned that Röhm and the SA had the power to remove him as leader. Göring and Himmler played on this fear by constantly feeding him with new information on Röhm's proposed coup. A masterstroke was to claim that Gregor Strasser, whom Hitler hated, was part of the planned conspiracy against him. With this news Hitler ordered all the SA leaders to attend a meeting in the Hanselbauer Hotel  in Bad Wiessee . 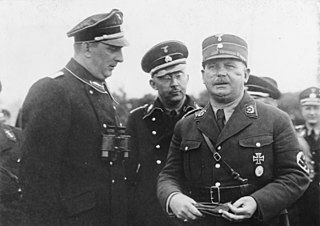 After the Night of the Long Knives, the SA continued to exist under the leadership of Viktor Lutze, but the group was significantly downsized. Within a year's time the SA membership was reduced over 40% in size. However, attacks against the Jews escalated in the late 1930s and the SA was a main perpetrator of the actions. In 1943, Viktor Lutze was killed in an automobile accident and leadership of the SA was assumed by Wilhelm Schepmann. Schepmann did his best to run the SA for the remainder of the war, attempting to restore the group as a predominant force within the Nazi Party and to mend years of distrust and bad feelings between the SA and SS. The SA also had several military training units. The largest was the SA-Marine, which served as an auxiliary to the Kriegsmarine (German Navy) and performed search and rescue operations as well as harbor defense. The SA also had an "army" wing, similar to the Waffen-SS, known as Feldherrnhalle . This formation expanded from regimental size in 1940 to a fully-fledged armored corps (Panzerkorps Feldherrnhalle) in 1945. 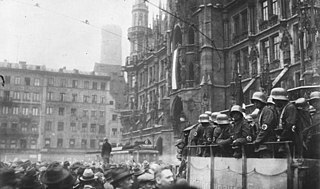 The Beer Hall Putsch, also known as the Munich Putsch, and, in German, as the Hitlerputsch, Hitler-Ludendorff-Putsch, Bürgerbräu-Putsch or Marsch auf die Feldherrnhalle("March on the general's hall"), was a failed coup d'état by the Nazi Party (NSDAP) leader Adolf Hitler—along with Generalquartiermeister Erich Ludendorff and other Kampfbund leaders—to seize power in Munich, Bavaria, which took place from 8 November to 9 November 1923. 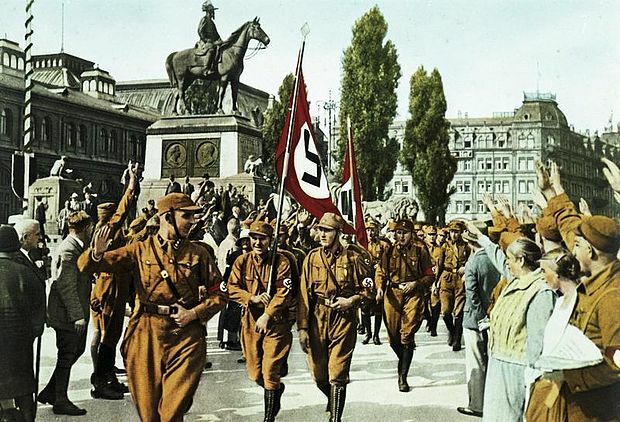 Approximately two thousand Nazis were marching to the Feldherrnhalle, in the city center, when they were confronted by a police cordon, which resulted in the death of 16 Nazis and four police officers. Hitler, who was wounded during the clash, escaped immediate arrest and was spirited off to safety in the countryside. After two days, he was arrested and charged with treason. Viktor Lutze was the commander of the Sturmabteilung ("SA") succeeding Ernst Röhm as Stabschef. He died from injuries received in a car accident. 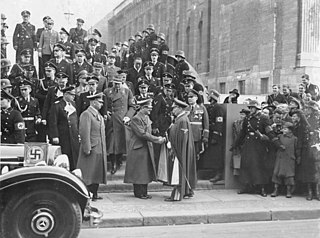 Lutze was given an elaborate state funeral in Berlin on 7 May 1943. The Kampfbund ("Battle-league") was a league of nationalist fighting societies and the German National Socialist party in Bavaria, Germany, in the 1920s. It included Adolf Hitler's Nazi Party (NSDAP) and its Sturmabteilung (SA), the Oberland League and the Bund Reichskriegsflagge. Hitler was its political leader, while Hermann Kriebel led its militia. Emil Maurice was an early member of the National Socialist German Workers' Party and a founding member of the Schutzstaffel (SS). He was Hitler's first personal chauffeur, succeeded first by Julius Schreck and then Erich Kempka. He was one of the few persons of mixed Jewish and ethnic German ancestry to serve in the SS. Stabschef was an office and paramilitary rank in the Sturmabteilung (SA), the paramilitary stormtroopers associated with the Nazi Party. The rank is equivalent to the rank of Generaloberst in the German Army and to General in the US Army. Julius Schreck was an early senior Nazi official and close confidant of Adolf Hitler. Franz Pfeffer von Salomon, also known as Franz von Pfeffer, was the first commander of the SA upon its re-establishment in 1925, following its temporary abolition in 1923 after the abortive Beer Hall Putsch. Michael Lippert was a mid-level commander in the Waffen-SS of Nazi Germany during World War II. He commanded several concentration camps, including Sachsenhausen, before becoming a commander of the SS-Freiwilligen Legion Flandern and the SS Division Frundsberg. He is known for co-murdering SA leader Ernst Röhm on 1 July 1934. In 1957, he was sentenced to 18 months in prison by a West German court for his part in Röhm's murder. The Stennes Revolt was a revolt within the Nazi Party in 1930-1931 led by Walter Stennes (1895–1983), the Berlin commandant of the Sturmabteilung (SA), the Nazi's "brownshirt" storm troops. The revolt arose from internal tensions and conflicts within the Nazi Party of Germany, particularly between the party organization headquartered in Munich and Adolf Hitler on the one hand, and the SA and its leadership on the other hand. 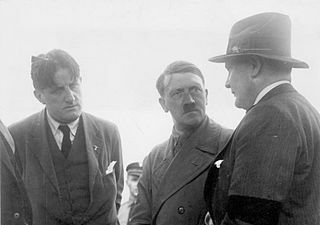 There is some evidence that Stennes may have been paid by the government of German chancellor Heinrich Brüning, with the intention of causing conflict within the Nazi movement. Beefsteak Nazi was a term used in Nazi Germany to describe Communists and Socialists who joined the Nazi Party. The Munich-born American historian Konrad Heiden was one of the first to document this phenomenon in his 1936 book Hitler: A Biography, remarking that within the Sturmabteilung ranks there were "large numbers of Communists and Social Democrats" and that "many of the storm troops were called 'beefsteaks' – brown outside and red within". The switching of political parties was at times so common that SA men would jest that "[i]n our storm troop there are three Nazis, but we shall soon have spewed them out". Brunswick Rally Badge, also known as the Badge of the SA Rally at Brunswick 1931, was the third badge recognised as a national award of the NSDAP. Through the regulations of 6 November 1936, a special Party Honour Badge commemorating the SA Assembly in Braunschweig on 17-18 October 1931 was created. Adolf Hitler, the dictator of Nazi Germany, initiated World War II in Europe with the invasion of Poland in September 1939 and was central to the Holocaust. He was hated by his persecuted enemies and even by some of his own countrymen. Although attempts were made to assassinate him, none were successful. Hitler had numerous bodyguard units over the years which provided security. ↑ Drury, Ian (2003). German Stormtrooper 1914–1918. Osprey Publishing. ↑ Before the end of 1919, Hitler had already been appointed head of propaganda for the party, with party founder Anton Drexler's backing. Toland p. 94. ↑ Mitcham 1996, p. 68. ↑ See Manchester p. 342. 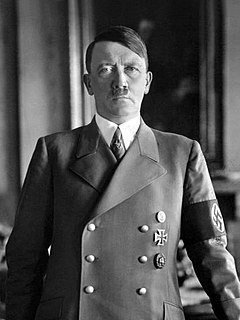 ↑ At a special party congress held 29 July 1921, Hitler was appointed chairman. He announced that the party would stay headquartered in Munich and that those who did not like his leadership should just leave; he would not entertain debate on such matters. The vote was 543 for Hitler, and 1 against him. Toland p. 111. ↑ The OC's most infamous action was probably the brazen daylight assassination of foreign minister Walther Rathenau, in early 1922. Klintzsch was also a member of the somewhat more reputable Viking League (Bund Wiking). ↑ Zentner & Bedürftig 1991, p. 807. ↑ McNab 2013, p. 14. ↑ McNab 2011, p. 142. ↑ Bullock 1958, p. 80. ↑ "SA". Encyclopædia Britannica . Retrieved 2017-07-28. ↑ Kershaw 2008, pp. 304–306. ↑ Baranowski 2010, pp. 196–197. ↑ Timothy S. Brown. Weimar Radicals: Nazis and Communists between Authenticity and Performance. p. 136. ↑ Alford, Kenneth (2002). Nazi Millionaires: The Allied Search for Hidden SS Gold. p. 5. ISBN 978-0-9711709-6-4. 1 2 3 Kershaw 2008, p. 306. ↑ Gunther, John (1940). Inside Europe. New York: Harper & Brothers. pp. 53–54. ↑ Wheeler-Bennett 2005, pp. 319–320. ↑ "Hotel Hanslbauer in Bad Wiessee: Scene of the Arrest of Ernst Röhm and his Followers (June 30, 1934) – Image". ghi-dc.org. ↑ Kershaw 2008, pp. 309–312. 1 2 Kershaw 2008, p. 313. ↑ McNab 2013, pp. 20, 21. ↑ McNab 2009, p. 22. ↑ McNab 2013, p. 21. ↑ "The Sturmabteilung or SA". History Learning Site. Retrieved 22 September 2013. ↑ Hoffmann 2000, p. 50. ↑ The NSDAP and its organs and instruments (including the Völkischer Beobachter and the SA) were banned in Bavaria (and other parts of Germany) following Hitler's abortive attempt to overthrow the Weimar Republic in the Beer Hall Putsch in November 1923. The Bavarian ban was lifted in February 1925 after Hitler pledged to adhere to legal and constitutional means in his quest for political power. See Verbotzeit . 1 2 Yerger 1997, p. 11. ↑ Yerger 1997, pp. 11, 12. 1 2 Heiden, Konrad (1938). Hitler: A Biography. London: Constable & Co. Ltd. p. 390. ↑ Mitcham 1996, p. 120. ↑ Friedrich, Thomas (2012). Hitler's Berlin: Abused City. Translated by Spencer, Stewart. New Haven, Connecticut: Yale University Press. pp. 213 and 215. ISBN 978-0-300-16670-5. Zentner, Christian; Bedürftig, Friedemann (1991). The Encyclopedia of the Third Reich . (2 vols.) New York: MacMillan Publishing. ISBN 0-02-897500-6. Evans, Richard J. (2003). The Coming of the Third Reich . Penguin Group. ISBN 978-0-14-303469-8.